There were some complaints in the media Saturday night about why the College Football Playoff committee even has weekly rankings. Ideally, I think it’s good to let teams know where they stand from week to week and start the process from scratch after the games are all finished. But I wonder if that really happened or if they just took the easy route and rubber-stamped what they already had as the top four (Clemson and Ohio St. switched spots, but that won’t affect anything except who wears what jersey and who calls the coin toss). Would it have been easier to pick Penn St. over Washington had the committee not declared a few days before that Washington was #4 and Penn St. was #7? If so, the weekly ratings should be abandoned. The committee also played it safe by picking as the BCS would have in all the major decisions. There were about 15 teams that were in contention for the major bowls (other than the “automatic” Western Michigan). This is how they would have finished if we had just kept the BCS system. The BCS average of the polls (AP and Coaches’ poll since the Harris poll no longer exists) and the medium 4 computer rankings. They’re calculated as fractions of the perfect score and then averaged. As I mentioned last week, I also disagree with Auburn’s selection to the Sugar Bowl, but part of the problem was that it was a three-way race. Although LSU gained on Florida in the last couple of weeks (and actually passed the Gators in the most-recent AP poll) and had the highest computer average of the three, obviously head-to-head came into play in subjective rankings and put LSU at a disadvantage. Auburn would have the stronger argument had they not also lost to their chief SEC East rivals and had that team (Georgia) not been worse than Florida. The answer Auburn people kept repeating about why it should be Auburn is head to head, but if that’s the primary way you decide between close teams (even if the game was early in the season), why is Ohio St. in the top 4 but not the team who beat them and then won their conference? Why is Florida St. in the Orange Bowl but not Louisville, who not only beat the Seminoles but blew them out? 63-20 is not similar to the difference of a foot or two or a second or two at the end of the game like the two relevant LSU games. Louisville did lose two games late to fall into a “tie” (although they finished two games ahead of the FSU in the conference standings), but so did Auburn. At least in Florida St.’s case, they blew away the Cardinals in the BCS computer ratings. To turn back to Washington vs. Penn St., one of the rewarding things about having my own objective mathematical system is when it validates my subjective opinion. I also like that I don’t have to do complicated mathematics like algorithms and least-squared regressions to get there. I’m not sure what any of those tell you about how good a football team is anyway. Washington didn’t play a single team in my final top 10 and went only 2-1 against the top 25. Penn St. went 2-1 against the top 10, on the other hand. The Nittany Lions did lose to #25 Pitt, but I don’t think it’s really fair to eliminate them based upon that when Washington had one of the worst non-conference schedules in college football. The committee has sent a clear message that record counts for more than schedule and (in view of Ohio St. making the field, although I agree with that) for more than championship status. Anyway, I think Penn St. did enough to overcome the additional loss; but it’s close enough that if Washington had played a slightly better schedule, the Huskies would have been fourth. So I firmly believe I got the formula right. There are teams (like LSU this year) who aren’t necessarily treated appropriately, but for me it’s always been about getting the top two to four teams right. That said, it will be interesting to see Penn St. against USC. I hope Penn St. can put this behind them, but it wouldn’t the first time a team that was snubbed or fell just short didn’t really show up for the bowl game. Although the Trojans and Nittany Lions have five losses between them, neither has lost since September. Both teams played the best (other) team in their own division and the best team of the other division in that span. Penn St. also played one of the runners-up from other division. Washington versus Michigan in that game might have been even better though. Then-Arkansas head coach Bobby Petrino pointed at the LSU sidelines in anger (apparently that LSU ran up the score in a 24-point win in 2011) in his previous game against the Tigers. Petrino is 4-4 against SEC teams since. Also, I want to reiterate that I’m content with LSU’s selection. You have to be extremely lucky to lose four games and go to the Sugar Bowl, so I can’t be too upset there. Tennessee, Florida, and Texas A&M were penalized more for late losses, so at least we got better bowls than they did. I’m not thrilled with it being early in the day on New Year’s Eve, when I’m typically up until 3 or 4 in the morning. Hopefully I can take a long nap. Also, our opponent will be another team with a legitimate gripe about being left out of a major bowl in Louisville. Financially speaking at least, the Citrus is the top non-CFP bowl, so that’s something else to be happy about. I’m not sure how much of that actually goes to the school, but with what Louisiana has been through lately, every little bit helps. 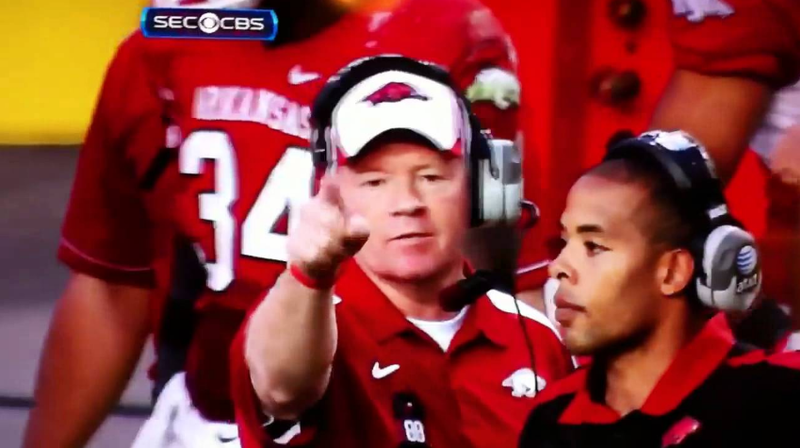 I always enjoy Bobby Petrino though. He’s a guy most of the SEC loves to hate for multiple reasons, but he’s also a very good coach. We’ve seen LSU DC Dave Arranda give Lane Kiffin about all he could handle, so I’m excited to see how Arranda and our defense do in this game. I’m less excited to see LSU try to produce on offense, but obviously Kentucky gave me some encouragement. There hasn’t really been time to make many adjustments on offense since the dismissal of Cam Cameron, but often bowl prep allows some flexibility in that area. It has helped LSU before even in years with relatively poor offenses, such as last year. Another team that made significant progress was Oklahoma, who will be the other team in the Sugar Bowl. I mentioned 2003 earlier. Oklahoma was in the Sugar Bowl that year of course, and Nick Saban got the better of Bob Stoops, who repaid the favor against Alabama in the 2014 Sugar Bowl 3 years ago. As a former New Orleans resident, welcome back to the Sooners and (other) Tigers. Oklahoma will play Auburn for the first time since the 1972 Sugar Bowl. This will be Auburn’s first Sugar Bowl in 12 years and only the second since 1989, so I guess that might have been a good reason to let them have this one. West Virginia also made a significant stride even though beating Baylor wasn’t the best win, but it beat a loss or not playing at all. Temple was also in the top 25 at this point last year before losing in the bowl game, but the Owls have another chance to finish in the final top 25 for the first time. I’m not sure if Pitt has finished in my top 25 recently, but I don’t recall them doing so. Of course they were helped out by Penn St.’s win, but it was more about the losses by Navy and Virginia Tech. If anyone is interested in my blogger top 10 poll on MacApp, click here. Before I begin, I just wanted to reiterate that I believe the correct way to evaluate conferences is to look at the games between conferences. I don’t think any result within a conference weakens it. So when I talk about wins, assume I mean non-conference. Also, I will refer a lot to P5 and G5. P5 are the traditional Power 5 conferences: ACC, Big Ten, Big XII, Pac-12, and SEC. Notre Dame is included in this group since it primarily plays a major-conference schedule and is given special privileges in bowl consideration. G5 are the other conferences: AAC (American), CUSA, MAC, MWC (Mountain West), and SBC (Sun Belt). Discussion of these will include BYU and Army. I opted just to do one for the season overall rather than trying to evaluate everything that happened since the last conference report separately. The ACC won three games against the SEC on the final week of the regular season; but with the relative weakness of the SEC East in recent years, this wasn’t that surprising. Any negative implications were overcome by earlier games between the two conferences. South Carolina kept North Carolina’s offense wrapped up to open the season, although the two teams went in drastically different directions since. 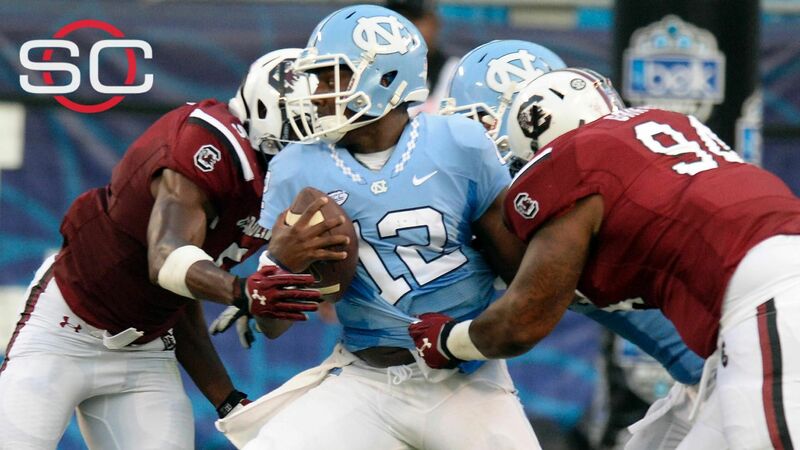 In hindsight, one of the best non-conference wins was by an SEC team that didn’t even make a bowl game when South Carolina beat eventual ACC Coastal champions North Carolina in the opening week. I don’t hold it against the Gamecocks that they later (in the final week of the regular season) lost to eventual ACC Champions Clemson by 5. The Gamecocks also suffered the worst loss of an SEC team by losing to the Citadel in controversial fashion, but you expect non-bowl teams to lose such games from time to time. The two bowl teams who were playing non-bowl teams, Louisville and Georgia, both won their rivalry games. Louisville only went 1-1 against the bottom half of the SEC though, as the Cardinals had lost to Auburn early in the season. On the other hand, Georgia had no non-conference losses. The only game that on paper should have been competitive—Florida St.’s win over Florida—is a credit to the ACC, although the Gators were showing major signs of weakness against such opponents as Vanderbilt (won by 2) and Florida Atlantic (won by 6 in overtime) in prior weeks. 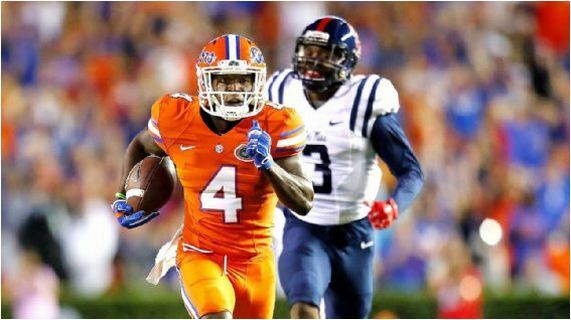 The Gators would have likely finished much worse in conference than 7-1 had they not played 6 SEC games by the end of October and had the remaining two games not come against two of the worst SEC teams. To talk a little more about why the SEC had a significant enough lead to remain #1 despite the final week, we can look at another of the worst SEC teams, Missouri. The Tigers beat Connecticut, not a good opponent by any means; but the Huskies were the only team to beat Houston, so they certainly had the talent to beat Mizzou. The Tigers also had a really quality non-conference win over BYU. I do give credit to the fact that teams like South Carolina and Missouri were even able to compete and in some cases win against good competition out of conference. Vanderbilt only went 1-2 against FBS opponents out of conference, but they got a road win over a Middle Tennessee team that will finish with a winning record. They also were a late two-point attempt away from tying Western Kentucky in regulation. This is why SEC teams have such good schedules in my formula. They are guaranteed eight games against tough teams at a minimum. It happens there were three teams in the SEC who went 2-6 in conference and one that went 1-7, but I think the results I discussed indicate they might beat some of the best teams in other conferences and would have a shot at some of the mediocre teams. If before the season you took the top 14 teams in the preseason poll and had them play 8 games against one another, there may well have been some that finished 2-6 or 1-7. As you might remember, Auburn was in the top 10 in most preseason projections and was actually #3 according to the ESPN power rankings. You can accuse me of trying to spin the results in these arguments, but I really don’t need to. By my calculations, the SEC won 81.5% of its games out of conference. That’s 3.1% better than the Pac-12, which is second. To show how big of a gap that is, the Pac-12 was only 2.0% better than the #4 Big Ten. Yet you can turn on ESPN any day of the week and probably listen to someone tell you it’s a down year for the SEC because it didn’t place a bunch of teams in the top 10. To be fair, all but a couple of the SEC teams played an FCS opponent whereas in the Big Ten (for instance) only half of the teams did. I would point out though that Big Ten teams played an average of exactly two games per team against either the bottom four conferences (being the MAC, CUSA, Sun Belt, or MWC) or 2-10 independent Army. The SEC played six fewer games against that latter group. Regardless, the SEC was similarly better than the other conferences when you subtract out FCS opponents. 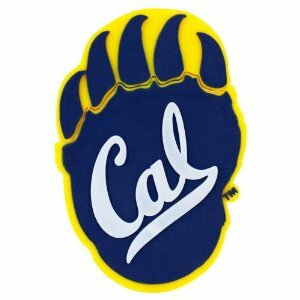 SEC 78.6%, Pac-12 75.9%, Big Ten 72.9%, Big XII 72.7%. 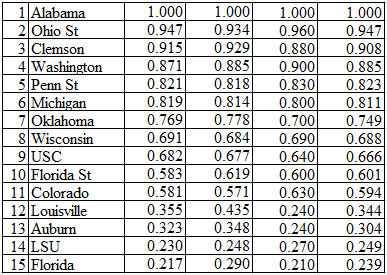 You might also quibble about FBS strength of schedule, but further analysis only strengthens these numbers. Other than the SEC, the only conference to win a majority of its games against the P5 (adding in Notre Dame) is the Big Ten. I think the SEC wins out in FBS strength of schedule because it played five games against the AAC while the Big Ten only played one, which it lost. I believe Houston, Memphis, Temple, and Navy were the best four teams in the G5 conferences as a whole, so that’s why I treat that conference a little bit differently. The four teams I mentioned only lost two conference games that weren’t against one another (unfortunately for Memphis, they played and lost to all three of the others). Apart from those two, the only non-conference game any of that group lost were Notre Dame’s wins over Navy and Temple. In that context, I think it’s understandable that Ole Miss and Vanderbilt both lost to teams from that group. Clearly, Ole Miss’s loss to Memphis was a negative for the SEC. It’s a negative for any conference to have one of its top teams lose a non-conference game, but that sure is better than a team like North Carolina losing to South Carolina or even a team like Stanford losing to Northwestern. The only non-AAC team with a strong argument for being among the top four G5 teams was Bowling Green, which lost to Tennessee, the same Tennessee team that lost late (in overtime actually) to eventual playoff team Oklahoma. Yet the Vols only finished in a four-way tie for fourth in the SEC if you combine the two divisions (so actually a two-way tie for sixth if you give LSU and Arkansas credit for being in the better division). Speaking of the MAC, I think that Tennessee win helps to balance out Arkansas’s loss to Toledo. 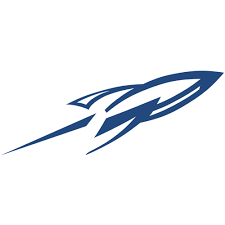 The Rockets did not play in the MAC title game, but they were in a four-way tie for the MAC West title and went undefeated against a good non-conference slate. So losing to Toledo was not as bad as it was made out to be when it happened. I also mentioned here how Arkansas was better statistically in the game. It’s pretty clear that they learned as the season went on to better translate yards into points as Brandon Allen’s passing improved. I mentioned the other conferences a bit above, but I’ll mention some things I left out below. The best Big Ten win was when Michigan St. beat Oregon, but to be fair, Michigan St. won its conference and Oregon didn’t win theirs. So that’s much less of a boost in my view than Northwestern’s win over Pac-12 champions Stanford. 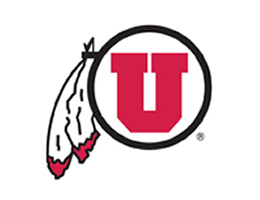 Utah’s win over Michigan was the best non-conference win by a Pac-12 team, followed closely by Stanford’s win over Notre Dame, but neither one was a lower-ranked team beating a top team of another conference. I think if Notre Dame had played a full ACC schedule, it would have finished second or third, so Stanford should have won that game. The Big Ten East was a good bit better than the Pac-12 South (don’t get me started on why they put Utah in the South), but I don’t know that third in the Big Ten East is much better than tied for first in the Pac-12 South. I haven’t talked much about the Big XII because it didn’t do much. Another part of Arkansas’s early-season struggles was a loss to Texas Tech. That seems to be the best non-conference win for the Big XII. The champion of the conference was supposed to beat Tennessee, so that’s not it. Minnesota is 5-7, and that was the best opponent that Baylor, TCU, or Oklahoma St. played out of conference. There were no good wins by the lower half of the conference, although West Virginia had a couple of borderline-decent wins over Maryland (which was had some bad luck in going 3-9 this year but made a bowl last year and is still a major-conference opponent) and Georgia Southern. Other than Clemson’s win over Notre Dame and the SEC wins mentioned, I didn’t go into details about the ACC’s other three wins. They were Purdue twice and Illinois. So I that FSU win over Florida was actually the conference’s best win. I mentioned the best wins by the MAC, CUSA, and AAC because they came against the SEC. That’s right, the best CUSA win was over Vandy. The Sun Belt’s best win was San Diego St., which went undefeated in conference after losing to South Alabama. The MWC’s best win was Boise St. over Washington. The Broncos finished in a four-way tie for second in the Mountain division. The Huskies finished with a losing record in conference, but you still don’t expect a loss in hindsight to a team like Boise. The winning percentages tell you pretty well who belongs where. One exception of sorts: I give the MWC the nod over the CUSA even though the CUSA had a slightly better FBS record because MWC teams also beat Virginia and Colorado. I know three wins, none of which were won by the conference champion or runner-up, weren’t against great teams. Colorado might not even qualify as mediocre. But I don’t think Vanderbilt by itself is really a comparison. I certainly can’t put Purdue or Central Florida ahead of any of those. The AAC had a better FBS record than the ACC but not a better overall record. I sided with the AAC because it played only one fewer P5 opponent despite having two fewer teams, and it won more games against P5 opponents. It was very close though. Had Georgia Tech upset Georgia or had Army beaten Navy, for instance, that would have made the difference. This was the only change from the prior Conference Report. Seems pretty simple to me if UNC and Florida don’t pull upsets. Oklahoma isn’t currently in the top 4, but they will pass up the loser of the Big Ten championship game. If Michigan St. wins, we could have two teams trying to emulate 2014 Ohio St. with ugly losses but wins over all the good teams on the schedule. Speaking of Ohio St., they would be next in line right now; but the way my rankings work, it doesn’t help you not to play, so Standford could move ahead. Likewise, the committee is supposed to favor a conference champion over a team that didn’t win its division. They also seem to pay less attention to record than the polls have in recent years. 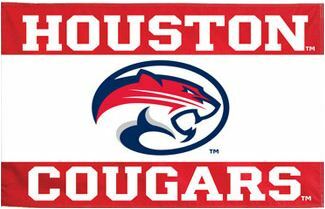 Houston against Temple for the AAC championship should be a good game. I’m glad that the G5 representative will really have to earn it this season. As for bowl games, I’ve seen LSU everywhere from the citrus bowl to the TaxSlayer (Gator) Bowl. I’m guessing an Alabama win in the SEC championship will put Ole Miss in the Sugar Bowl over Florida even though the Gators beat the Rebels. Each would finish with three losses; but Ole Miss has looked a lot better, and it’s usually not good to lose two in a row. The Rebels were a 4th-and-25 stop against Arkansas away from making the SEC title game. Arkansas has three conference losses and they beat LSU, but the Hogs lost two games out of conference. Tennessee and Georgia also have three conference losses apiece. The Vols have the benefit of five straight wins and the non-conference loss to Oklahoma is looking pretty understandable right now. It will be very interesting to see how this mess is sorted out. It’s basically the two respective divisional champions, Ole Miss, and a big cluster afterward. Auburn will apparently get the worst SEC bowl, which seems to be the Birmingham Bowl. Edit: The NCAA is considering allowing 5-7 teams to play bowl games. Missouri has already announced it will not pursue such an invitation. Kentucky may. Mississippi St. and Texas A&M have four conference losses; but unlike others, they do not have non-conference losses. I’m going to warn you now this will be longer than usual. I’ll keep the Les discussion to about 500 words though. So it seems that with the additional loss since I last wrote on the topic, the rumblings about Les Miles being pushed out are more serious now. The assumption seems to be that LSU will suffer at least one more loss. Few seem to be suggesting that Les would not be allowed to coach the bowl game at this point, and of course preparations for Texas A&M, which has not beaten LSU since 1995, are in full swing. The source I read about (I’m not linking the article out of principle) said that it would become a more complicated issue if Miles were to win both remaining games. I will say that if we lose this one, especially if it’s not competitive, there would no longer be a good argument for keeping Miles. Even though I don’t think Cam Cameron has done all that much for LSU and I understand there are young players making mistakes, I think it would show that Miles no longer has the ability to properly intervene in problem areas. LSU has only had back-to-back losses a couple of times before this in Miles’ tenure. One of them was when LSU struggled to settle on a QB the entire season in 2008. Another was last year’s loss to Arkansas, which came after the Tigers got beaten up against Ole Miss and Alabama. Losing four in a row, regardless of the reasons, I think would show more clearly that Miles is losing his touch and may not be able to make mid-season corrections in the future even if he were to improve his coaching staff for next season. I think discussing alternative coaches in depth is premature, but I mentioned last time that the only coaches I would feel comfortable with from a win-loss perspective (even though I don’t really care for any of them personally) aren’t available. Jimbo Fisher has been mentioned, but I’m only lukewarm about him given the kind of season the Seminoles have had and his struggles with offense production at times when he was at LSU (under both Saban and Miles). 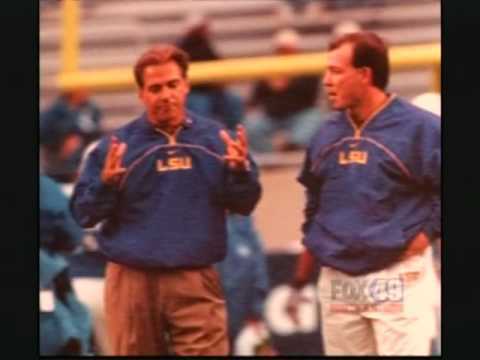 Jimbo Fisher (right) with Nick Saban. 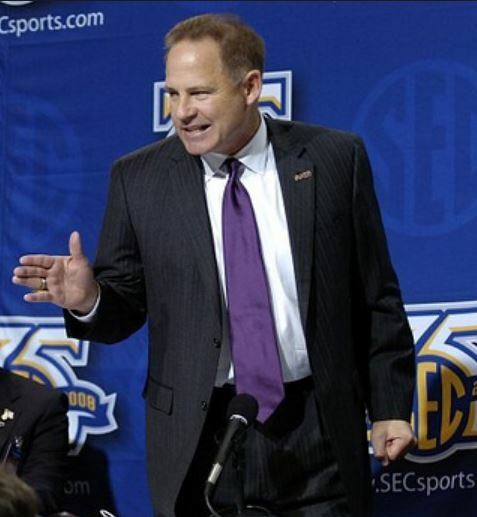 Fisher also coached under Les Miles for two seasons as the offensive coordinator. That’s all I want to say about that. I hope we get some resolution before the bowl game (such as it’s Les’ last game, Les is coming back but Cam isn’t, whatever) even though Miles and AD Joe Alleva have stressed that evaluation time is after the whole year is over. As I think most fans know, a lot of personnel changes are decided in that time even though sometimes they’re not announced until later. LSU is still a top 25 team according to many computers and voters, by the way. So I’ll move on to those. So at least according to my rankings, IF things go according to plan, it would be Alabama vs. Notre Dame in a rematch of the 2012 title game and Clemson vs. Michigan St.
Notre Dame does have to beat Stanford, however. Also, Michigan St. lost to Nebraska, so of course they could just as easily lose to Penn St. or Iowa. Although they’ve looked terrible (Notre Dame didn’t look great either), I guess Florida could still make an argument by winning out. That loss to Texas is dragging down Oklahoma right now, but if Iowa, Notre Dame, and Florida lose, it seems like they would be a good pick… assuming they can win Bedlam. Oklahoma St. would also have an argument if the above scenario plays out except for them winning Bedlam instead. 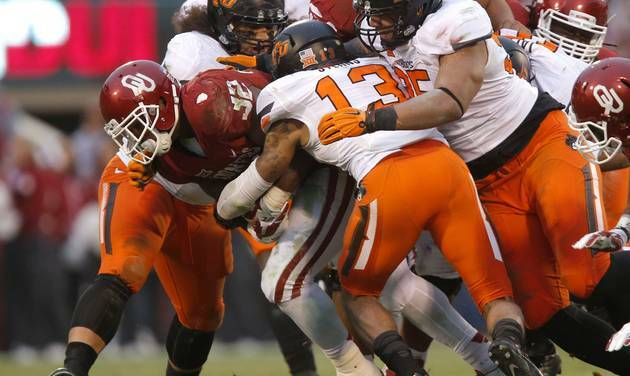 Bedlam, the annual game between Oklahoma and OK St., may be even more intense than usual. More remote opportunities exist for Stanford or the winner of Ohio St./Michigan. Utah was finally taken out for sure by UCLA, which has a chance to win the Pac-12 South and derail Stanford the next two weeks. USC could also try to do the same. Stanford has beaten both teams already. Navy, whose only loss was against Notre Dame, looks like the best G5 candidate for a CFP bowl. Oregon, Mississippi St., and Temple all won games against teams at the periphery of the top 25. Alabama, Clemson, Florida St., Iowa, LSU, Michigan St., Notre Dame, Ohio St., Oklahoma St., Penn St., Pittsburgh, Stanford, TCU, Temple, Washington St.
Before I begin, I wanted to refer people to my Alabama blogs. Most of my hits this week have already been the main rivalry blog. On Friday, I wrote specifically about LSU’s meetings with Alabama while undefeated. LSU will hope to reverse its recent fortunes against Alabama. In his weekly press conference, Nick Saban referred to this play as a counter to the idea that LSU-Alabama games are won by playing conservatively. Also, these are the completely objective numerical results in my full computer ratings. I don’t have a whole lot to say about last week’s games. We seem to have had a bit of a lull in anticipation of this week. I don’t know if I’ve ever seen a Saturday with so few top teams in action. Obviously, a couple of them had interesting endings though. I picked WSU to win, so that was a tough late disappointment, especially combined with the late innings of the last two World Series games. I also would have felt vindicated had Temple won, but I make no apologies for having an undefeated team ahead (by just one spot in that case) as long as that team remained undefeated. Another example may play out this week when LSU plays Alabama. Alabama is favored and while I definitely lean toward taking LSU and the points (though I would remind gamblers of the possibility of Alabama winning by 7 in overtime… again), it’s very difficult to pick the Tide to lose that one. If Alabama wins, the rankings will reflect that at that time. I don’t believe they should now no matter how one thinks the game will unfold. I’ll give additional LSU and Alabama examples. I thought LSU would win all along in the 2007 championship and felt the same way about Alabama in 2012. I still thought it was right to put the team with fewer losses (Ohio St. And Notre Dame, respectively) higher. Of course a prerequisite to that is similar schedules, so that’s a factor for certain undefeated teams below. I’m expecting that with a win LSU will be on top, but I’m not sure. It may be that if Clemson wins and some of their prior opponents such as Notre Dame also win, they could move up. I think Alabama would have too far to go. Current computer #1 Michigan St. would have a win over what would become a 3-7 (FBS) Nebraska team, so I don’t know if Sparty can hold on. Even Iowa could possibly move ahead. If LSU loses, there is a very high chance that I’ll have a number one in this list for the first time. I have not put Michigan St., Clemson, or Iowa first in this list before. I nearly put Iowa in 2009 when they were the computer #1, but they didn’t make it past this week of play before a loss. With games as significant as Alabama-LSU, Clemson-Florida St., and Notre Dame-Pittsburgh, and TCU-Oklahoma St., I think that affords a suitable enough occasion to just let the numbers do the talking going forward. Texas A&M, Mississippi St., and Ole Miss are also playing important conference games that could bolster the winner of the game in Tuscaloosa. In other conferences, there are games like Penn St.-Northwestern and Duke-North Carolina than can have effects throughout those respective conferences. Also, TCU would get a big boost to its résumé if Minnesota can upset Ohio St. So for a number of reasons, I really think this is the big week that will tell us who belongs where in the conversation. I wouldn’t make a big deal out of the playoff rankings tomorrow whatever they are. Skip to the bottom for the top 25 or click here or use the tab at the top to access my full computer ratings. Ohio St. was once again underwhelming, but once again there was no clear successor. I sometimes look at other computer rankings to see if it’s just something weird about mine, but it isn’t. Ole Miss and UCLA were in the consensus computer top 5 and of course both lost to teams they were supposed to beat and neither game was close. Anyway, so I’m keeping Ohio St. #1. The protected top four from last week has been reduced to three with the Ole Miss loss. I’m putting LSU ahead of Michigan St. because they are higher in the formula. Ohio St., LSU, and Michigan St. are all in the top 10 of the formula, so I don’t feel like this is an inappropriate departure. I also am replacing Temple with TCU in the top 10. They were ninth and 11th, respectively, so I don’t think switching them is a big deal. I also decided to put TCU instead of Iowa, who is new to my top 25. The only other change was a group of teams who were in the top 15 last week and who I made numbers 22 to 25 this week. Ole Miss, UCLA, Georgia, and Notre Dame were the four teams. I thought Ole Miss in particular should not fall from #2 on my list (which had been slightly higher than the computer ranking) to outside of the top 25. Florida WR Brandon Powell outruns the Rebel defense for a 77-yard touchdown. Memphis and Navy have no wins over the former BCS teams/conferences, but they have chances coming up, so they will move in if they win those. Penn St. and Kentucky have losses that I don’t think their wins quite overcome yet. I went ahead and left Houston in because they beat Louisville, a major-conference bowl team from last season. Louisville didn’t have a good first week in losing to Auburn, but they played Clemson close and had a good road win over previously undefeated North Carolina St. on Saturday. So I shuffled around the top 11 a bit, and I switched four computer top 25 teams with four non-top-25 teams. Those four teams are in the order the computer gave, and all the teams in between are also in the exact order from the computer formula. I may tinker slightly in the next couple of weeks, but in the ratings in two weeks, the current computer ratings will either be validated or the cream will better rise to the top. Penn St. @ Ohio St. I think just about everything should be sorted properly on its own between now and then. I’m not saying there aren’t any big games this coming week, but nothing like that lineup of decisive games. Anyway, here is my current top 25. I mentioned previously I started doing my preliminary computer calculations. They account for approximately 50% of the top 25 below. After the top four (two of which, LSU and Michigan St., were also in the computer top four), what I did was pick the rest of my top 25 and put them in the order I wanted them without looking at the computers. Then I averaged where I wanted to put them with the ranking the computer gave them. For instance, I had UCLA sixth, but the computer had them eighth. That averages to seventh. I had TCU fifth, but the computer had them fourth, so that averages to 4.5. 4.5 is a smaller number than 7, so TCU went ahead. There were some teams in the computer top 25 and not in my top 25, but I didn’t rank any of those teams. I don’t think teams like Indiana and North Carolina St. have proven they should be ranked yet; but if they’re ranked two weeks from now by the computer, they will be ranked in my top 25 list as well. So I did not allow the computer to take any teams out of the top 25 I had on my own, but the computer does not have a high opinion of either USC or Wisconsin. I gave them a reprieve for this week at least though. I think they’re both in the top 20 toughest teams to beat, it hasn’t really shown on the results (meaning wins and losses) against their respective sets of opponents so far. I don’t think many people would take Indiana to beat either one on a neutral field. Again, that won’t matter in a couple of weeks, but I think it should matter at least for now. I usually don’t take a team from outside the top 25 and put them in the top 10, but I only put Florida 19th. Three decent wins in four weeks, however, puts them among the best teams in the computers, so that’s just where the average takes them. Utah was closer to where I had in mind originally. I had them 12th. 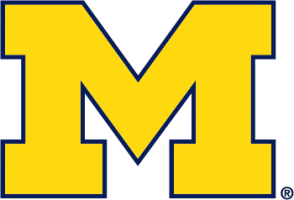 Not only was I considering the win over Oregon, but I was also considering the fact that Michigan just beat a ranked team (BYU) and has not lost since playing the Utes. I ranked Temple after Week 2 and only wanted to put them back to #25 this week, but Penn St. and Cincinnati still give the Owls a decent amount of points. I mentioned Wisconsin hasn’t done much to impress the computers, and that was by far Alabama’s best win, so that explains why they’ve fallen so far. In my formula, every loss is a negative, so some teams without losses are higher even though I understand many of them haven’t played a team as good as Ole Miss. Northwestern is a bit higher in the computers of course, but they beat Stanford, and Stanford looks good otherwise. Subjectively, I would move the Wildcats up more gradually, but the best they could have possibly done against their three FBS opponents is beat all of them and for those opponents to be a combined 9-3. They beat all of them, and those opponents are a combined 8-4. The only extra loss was by Ball St. to Texas A&M, an undefeated team. Northwestern doesn’t have any points for their win over winless Eastern Illinois, but the other games are good enough to give them a higher computer rating than anyone else right now. The only other team that doesn’t match up fairly well to last week’s ranking is Oklahoma St., who falls eight spots. The Cowboys’ four opponents have only one win combined over FBS opponents (Texas over Rice). Even though they are undefeated, Oklahoma St. will fall out of the top 25 unless they beat Kansas St. on Saturday. No one else changed more than five spots, so I think they align pretty well for a transition week. I reserve the right to make a couple of changes to the computer ratings for next week when I publish this list (the list I publish on the computer rating site is always 100% objective), but after that it will follow the computer ratings almost completely. So basically whoever is the computer #1 after Halloween can expect to be #1 on this list. I’ll just start by mentioning a couple of other blogs and then get to the rankings. I don’t think I’m the only person surprised by some of the results and final scores from over the weekend, but mostly I feel like I made some good choices in the early rankings. I did have Arkansas ranked, but I didn’t have them in the top 20 like the major polls did. I also had Auburn ranked (at 17th last week), but they were picked by voters to win the SEC. They were also picked #3 in preseason by ESPN the magazine. I think I’ve been rightly skeptical about both teams. I’m glad I picked Michigan St. above Oregon, but I was right to only put them a few spots apart in the preseason. I know their quarterback got hurt (and the other one from last year is now at Florida St.), so I don’t want to be too harsh, but I’m also glad I didn’t put Notre Dame in the top 10. Georgia is another team I’m glad for the moment I kept out of the top 10. They didn’t even look like a top-25 team against Vanderbilt. I also made the right call to rank Oklahoma but not Tennessee in preseason. Obviously a lot can change throughout the season. Like I tried to explain in preseason, however, the idea is mostly to rank how the teams start out rather than the projected finish, so overall I think I did a pretty good job based on what I’ve seen. I kept Missouri in and not Auburn because they weren’t playing an FCS team and they won in regulation. Also unlike Auburn, they were on the road and they took the lead for good in the third quarter. Arkansas and Boise St. had losses to unranked teams, so the decisions to remove them were easy. I decided to rank BYU, who also won at Nebraska. They had the Hail Mary to win, but they were only down by one point before that. Tell me what other team has a combination of two defeated opponents that looks better right now. I did not decide to rank Toledo, partly because Arkansas was their opening game, so there is nothing else on which to judge. I think it’s much more likely that Arkansas isn’t deserving than that Toledo is really good. Another team with a respectable combination of wins is Temple. They beat Penn St. and won at Cincinnati. You might laugh at them as a ranked team, but if they were named Alabama or Michigan or something of that nature, they would almost certainly be ranked. They may not last, but it’s still a pretty respectable start. I also decided to go ahead and rank Northwestern given their win over Stanford. They played Eastern Illinois, an FCS team this week; but I don’t think many other teams could play Stanford and Eastern Illinois and give up fewer than 7 points combined. Northwestern beat the Panthers by 41, whereas last year Minnesota only beat them by 22 and Ohio U. only beat them by 15. Eastern Illinois went .500 against other FCS teams last season. A few interesting games next week, including Ole Miss going to Tuscaloosa. It will be interesting to see if Ole Miss dictates the tempo, not that that would guarantee a Rebel victory anyway. It could be like the 49-42 Alabama win over Texas A&M exactly two years ago. Two big games in Los Angeles (although the home teams should win) as Stanford goes to the Coliseum and BYU visits the Rose Bowl. I don’t expect Northern Illinois @ (1) Ohio St. to be too interesting; but the Buckeyes were only up 17 after three quarters against Hawaii, so the early going could be close. Every other game should be boring, although it’s possible Louisville can finally play a good game when (8) Clemson comes to town. 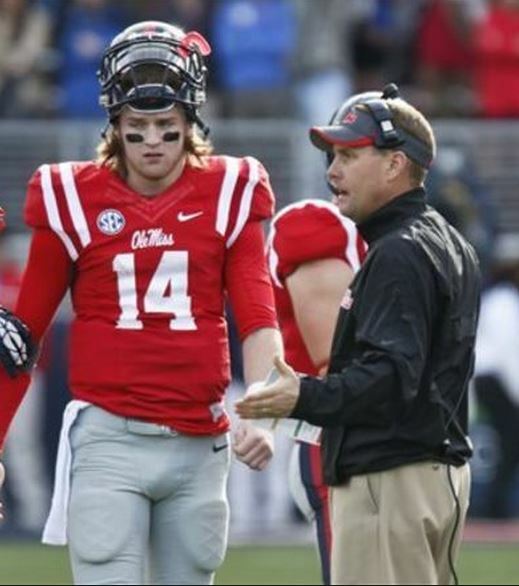 Hugh Freeze and Bo Wallace could get their first big road win… or not. I discussed possible outcomes for this game to some extent when I mentioned my subjective top three versus my computer top 3. Also, if you’re not among the large rush of people that discovered this for some reason, I updated my LSU/Ole Miss rivalry blog and will do so again after the game. I’m not enthusiastic about the LSU offense despite the easy win last week. The Tigers were helped out by defensive and special teams play to a large extent. However, I’m very skeptical of this notion I’ve seen out there that LSU won’t do anything in the running game and will be forced to fall back on the passing game. (1) [Apart from NMSU, LSU hasn’t] given it up more than once in any other game. Last week against Kentucky was the first time all year LSU didn’t come up with a takeaway and lost the turnover battle, and it was only -1. If the LSU defense can hold down the Rebel offense and not keep it from getting up early, and the O doesn’t make a slew of errors, this should be close. (1) is if things go well for LSU, at least the part that says “this should be close” (close meaning within a few points, not within a few touchdowns). In addition to some possible defense and special teams contributions, I think we can run the ball really well; and in recent weeks, we’ve added more variation to the running game. LSU might also win if some of the 10- and 20-yard passes are made possible with good decision-making and a varied running game. The passing game has been admittedly weak; but like with Zach Mettenberger against Alabama two years ago (where he had been generally ineffective in earlier games, and it was expected the Alabama defense would destroy him), I think it’s due for a decent game. And let’s not forget LSU did pass for 341 yards against Mississippi St. I know we don’t want to get down like that again, but those 341 yards probably would have been enough to win the game had LSU managed to punch the ball in the end zone rather than falling a yard short. I certainly think Mississippi St. knew we would be passing late in the 3rd and in the 4th quarter, and we still got those yards and points (19 in the last 12 minutes, 13 in the last two minutes) . If we don’t fall behind like that, Ole Miss won’t necessarily know when a pass is coming rather than a run. I don’t accept (2) at all. I don’t know who Elijah McGuire is, but he plays for ULL and he ran for 66 yards on 10 carries. They ran for 197 yards overall, and that was with 30 pass attempts. If our running attack is worse than ULL’s, we should be winless in conference. Vandy (which IS winless in conference) didn’t put up as many yards against Ole Miss as ULL did, but one RB ran 18 times for 95 yards. Temple, by contrast, held him to 70 yards and Vandy as a whole to 54 yards (I guess after sacks were subtracted). I think (3) is realistic though. We could get yards on a few drives, stall around the 30 or 40 and struggle to put any points on the board all night. On the other side, Wallace can have a really good night and lead the Rebels on four or five touchdown drives. Our defense will not be able to keep up if our offense has few if any sustained drives. I could go on about Ole Miss having inflated defensive statistics, but our offense does have the potential to make them look really good regardless. Ole Miss fans have talked of “good Bo” and “bad Bo,” in reference to their quarterback. I happen to think bad Bo might make an appearance in dealing with a night game at Tiger Stadium and a defense that’s coming together well. I don’t think Wallace will completely unravel, so LSU could have a number of things go well and still lose a close game. Also like I said, they could have some things go not so well and yet not disastrous and still lose by a considerable margin. I mentioned a couple of different Alabama games for comparison earlier (because they’ve more commonly been the level of a team Ole Miss is this year), so I’ll mention one more. This one wasn’t a close game. Last year, LSU lost to the Tide, 38-17. The Tigers lost two fumbles and were penalized for 73 yards, but it didn’t take any kind of disaster or meltdown for that big of a loss to take place. Mettenberger actually had a pretty good game: 16/23 for 241 yards. LSU also went a respectable 7/12 on third downs. But when it got to be late in the game, Alabama would take over and not give the ball back. They took a 7-point lead after a nearly 8-minute drive in the third quarter. Then they took14- and 21-point leads after fourth-quarter drives of about 5 minutes apiece. In total, the Tide had the ball 20 of the final 27 minutes of the game. Meanwhile, LSU just hit a wall on offense. There were a couple of short completions (maximum 20 yards) and a few runs (maximum 5 yards), but they only got a couple of first downs. So that’s something that can happen against a good team. I think it’s more likely LSU will be a better running team than a passing team (the opposite of the Alabama game last year), but sometimes good teams just take over and there isn’t much you can do about it. Basically, I can foresee anything from an LSU win by a few points to an LSU loss by a few touchdowns. Ole Miss could run away with it and win by 30+ like Auburn did, but I’m fairly confident that will be LSU’s worst loss of the year, probably by a decent margin. One other thing I found interesting: although Ole Miss ranks #8 in total defense, #7 is Wisconsin, which LSU beat in Week 1. I had a lot of thoughts about what the conferences should do moving forward, but there were a couple of LSU issues I wanted to cover first, this being the last non-game week. Mettenberger seems to be dong extremely well. In the final scrimmage, he completed 26 passes on 36 attempts for 336 yards. There was an indeterminate number of TD passes, but I’m not sure how relevant that is anyway. According to the stats given, he didn’t fare nearly as well in the first two scrimmages, with only 15 completions each time. Kenny Hilliard seems to be at or near the top of the RB depth chart, so I’m excited to see him this year. There are a couple of linemen who are “a little nicked,” according to Les, but I’m still feeling fairly positive about the offense. Defense is a little more up in the air. There is only one real returning starter in the secondary, and there has already been an injury. FS Eric Reid is the only returning starter from that unit. The defense as a whole returns 4, although Tharold Simon had a lot of impact in more limited playing time last year. There is a lot of talent, but talent alone doesn’t stop tackles from being broken/evaded and passes from being completed by the other team. In recruiting news, LSU has two good incoming quarterbacks, Rivals’ #4 pro-style QB and another product of the state of Georgia (as was Mettenberger), Anthony Jennings, whom Rivals ranks as the #12 dual-threat QB. It will be interesting to see how much LSU goes for the dual-threat options in the future. LSU is now ranked #5 in overall recruiting class by Rivals. Onto the conferences, I know I like to talk about this topic a lot, but the regional rivalries and series histories are important to me. First off, I’m hoping the ACC and SEC stay at 14. The only way I would support a 16-team conference would be if 7 or maybe 8 games counted toward the conference title. With 9 games, you could have one team with two extreme lightweights from the other division as well as an extra home game, and that team could end up ahead (either by a single game or due to a head-to-head tiebreaker) a team who had an extra road game and played two of the best teams in the other division. I can countenance 8 games because there may be a natural rival in the other division anyway, and it could be used to even out the home/away situation mentioned. One game is less likely to be determinative than two. Such an arrangement might work in the ACC if it continues to poach the Big East but I don’t think it would work well in the SEC. I did have one specific thought about the SEC. I think it would make more sense if West Virginia were in the SEC and Missouri went back to the Big XII. They’re losing a lot of good Big 8 rivalries, and except for Arkansas, I don’t know if anyone is very excited about Missouri joining, particularly not in their division, the East. As referenced, Missouri does provide something good in that it’s closer to Arkansas than any other team and as Arkansas had no logical interdivisional rival before (it had been South Carolina), that was a marriage made in heaven. WVU, however, does not have a logical interdivisional rival. Since the two Alabama teams are seemingly off-limits (can’t break up Alabama-Tennessee or Auburn-Georgia), the one that made the most sense was Mississippi St., whose currently “rival” is Kentucky, which in turn could be paired with Arkansas as two of the more Northern teams. This still would add significant travel times to the interdivisional rivalries for the other teams. With an 8-game schedule, the average travel time is almost exactly the same, around 740 miles (the interdivisional games make almost a negligible difference since only one would be played per year). If a 9-game schedule were adopted, WVU would involve an average travel distance of 877 miles to Missouri’s average travel distance of 851 miles. This was calculated by only counting the non-annual distances for 1/3 since only two of the 6 leftovers would be played every year. But restricting it to permanent rivalries (including divisional rivalries), WVU is only an average of 590 miles to Missouri’s 632. And strictly looking at divisional rivalries, it’s 525 for WVU to 685 for Missouri. There is a thought out there that maybe with 14 teams, not every team should have the permanent interdivisional rival, although you would at least want to keep a few of them. The two involving Alabama teams especially, but Ole Miss-Vandy is a good tradition too, even though it’s not usually two of the better teams of course. LSU has played Florida for 40 years in a row, but this has only really meant a whole lot for the last 15 years. No one (except Lou Holtz) is going to miss Arkansas-South Carolina, and few would miss Miss. St.-Kentucky. Boise St. should forget about the Big East and instead join the Big XII. TCU came to its senses and gave up the Big East for the Big XII before playing a down in the Big East. A coast-to-coast, Canada-to-Mexico-to-Cuba (Tampa isn’t Miami but still isn’t far) league is completely ridiculous. Of course BYU would seemingly want to join the Big XII, and this would actually make sense to give Boise a more natural rival. San Diego St. would be another possibility, but let them and the Big East be stupid together, basically the same sentiment I have regarding WVU and the Big XII. I know that still isn’t as regional as I typically argue for, but Texas, Oklahoma, and Kansas make up 8 teams. So it would still mostly be regional except with teams to the Northwest (2), North, and Northeast–enough to be a presence in those other regions without destroying the natural rivalries. And the schools in question don’t have better offers anyway. I don’t know how Tulsa doesn’t get involved in all the changes being made, but maybe that’s because it’s not a big school (fewer than 3000 undergrads). Plus, it’s going to be a team within some reasonable distance of Louisiana Tech, which has been a misplaced member of the WAC for years. In 2005, several Texas teams bolted for the CUSA when it expanded, but Louisiana Tech (in Northeastern Louisiana) was left out, with its closest opponent all the way in southern New Mexico. Now this will finally be remedied. Tech will have Tulsa to the Northwest, North Texas to the due West (only requiring one interstate highway really), UTSA and Rice to the Southwest, and Tulane and Southern Mississippi to the Southeast. It would have had Memphis to the Northeast, but that’s another seemingly misplaced future Big East member. The Big East still has the two NYC-area teams, and it still has the two Ohio Valley teams, but it’s not extending into the rust/coal belt in what used to be the west of the conference, and it’s not going North of the NYC area to Boston or Syracuse. Why not build on that and become a regional conference again as it should be, only this time more Southern? 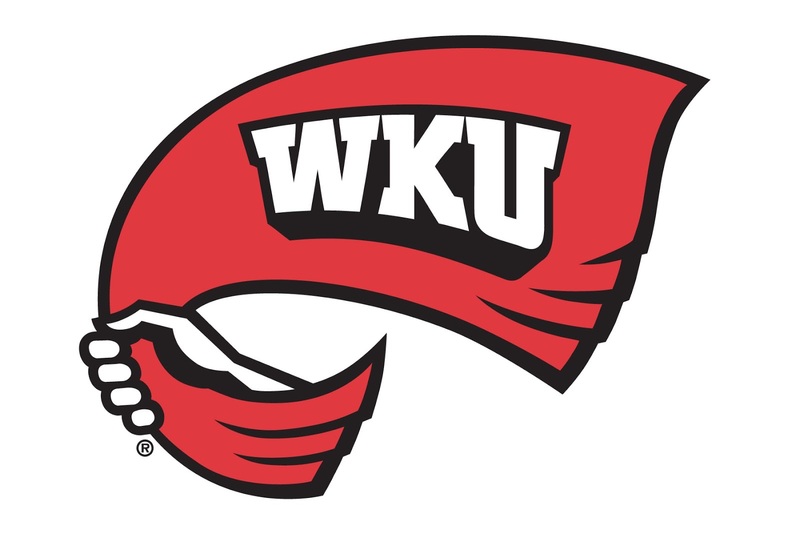 There are a few CUSA teams that could rejoin Cincinnati and Louisville. East Carolina and Central Florida might be good, for instance. Maybe Villanova could be convinced to make the leap to FBS. Temple is already moving back to the Big East. But instead it’s on a ridiculous quest to become some hybrid of the original Sun Belt conference (which went from Moscow, Idaho, to Las Cruces, New Mexico, to Murfreesboro, Tennessee, to Miami) and the 16-team WAC (Hawaii to Wyoming to Fort Worth, Texas). Hopefully, it will be a similarly temporary arrangement. Maybe the Big West can become more of an FBS conference again and they can draw the line of separation at the Mississippi River at least. Or perhaps several members can be the football WAC and perhaps in other conferences in other sports. It does not seem the current WAC will have enough teams for football in 2013. I wonder if the BCS could have avoided some of this by kicking the Big East sooner and replacing it with the Mountain West. At least the MWC would have stayed together longer. I’m unclear on why the MAC decided it needed 13 teams and replaced Temple with UMass. I fail to see how 13 is convenient, fair, or logical. Perhaps Youngstown St. can become an FBS team and they can make it an even 14. That’s another thing I wonder. We have 4 new FBS teams this season; will the new and upcoming conference shifts result in increased pressure from FBS conferences to tempt the FCS members?